How to lease out my token (membership)? Turn on 2FA in ‘Settings’ and save your recovery codes (we don’t allow depositing and withdrawing without 2FA enabling). Deposit PBT token(s) into the unique wallet address provided (be careful, we update addresses time to time) in My membership - Leasing section. The minimum amount is 1PBT. After 20 confirmations, the funds will be deposited to your account. This normally takes no longer than 15-30 min and depends on the blockchain load. Your deposited funds will be shown in ‘Available for leasing’. Tokens for lease -- How many tokens you would like to place on “Lease Market”. Tokens can be booked separately depending on demand. PBT price -- Primalbase membership leasing price per day. This is up to you. Min price is 0.005 ETH. There is no option to set a price for different locations, but you can manually change your price anytime you want to adjust it to the market. Booking window -- Number of days in advance your order can be booked. This isn’t an expiration period. It’s a sliding window which moves your order on the market forward if there aren’t any bookings yet. 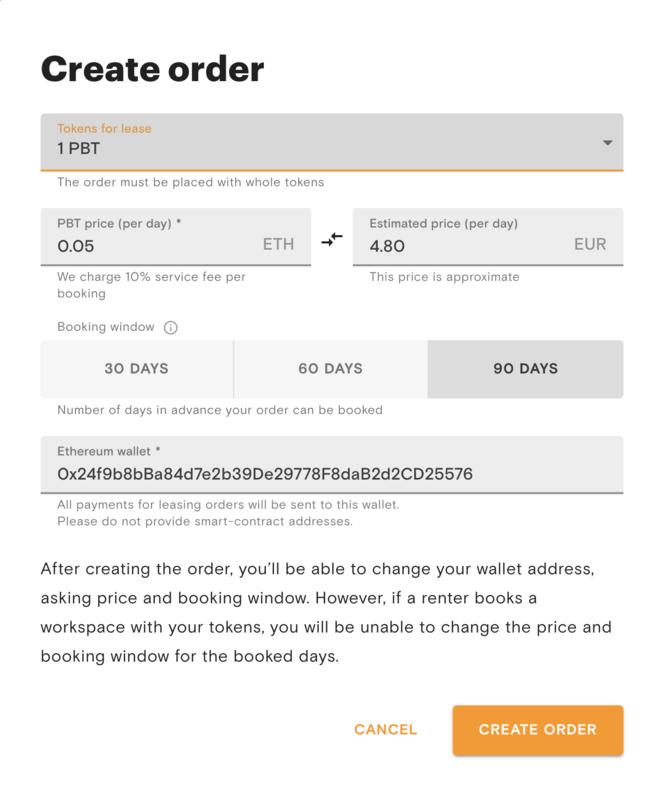 Booking window gives you the flexibility to control your token availability on the market. Take into account that the max. booking period for a desk is 90 business days and for the office it is 10 business days. Ethereum earnings wallet -- Ethereum wallet address to get your earnings. This applies to each order you create. 6. Created order is placed on ‘Lease Market’ and supports the availability in our calendar across all locations. 7. If there are bookings, you will be notified by email or you can check earnings in Transaction history or on the dashboard in section ‘My Membership -- Leasing’.